It’s not always easy to come up with new ideas to keep your marketing fresh. That’s why, in this article, we’re showing you 10 email popups that have increased subscriber and customer numbers for our very own customers. These are website popup examples with proven track records. 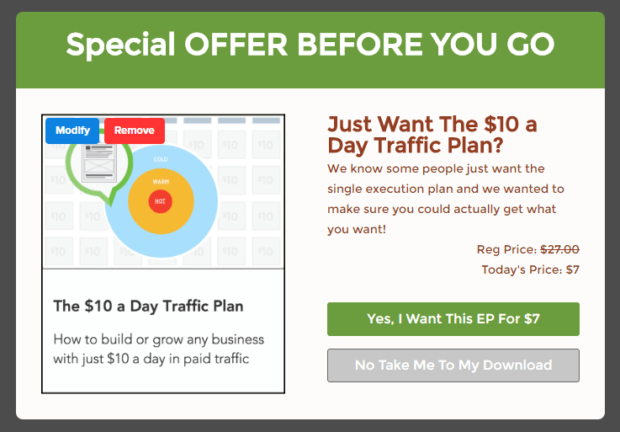 In all of the examples we’ve included, the websites got great conversion rates with these awesome popups from OptinMonster. And that’s not all! Along with the popup design inspiration, we show you why these popups worked, so you can adapt the strategies used to create your own successful website modal popups. Did you get that? 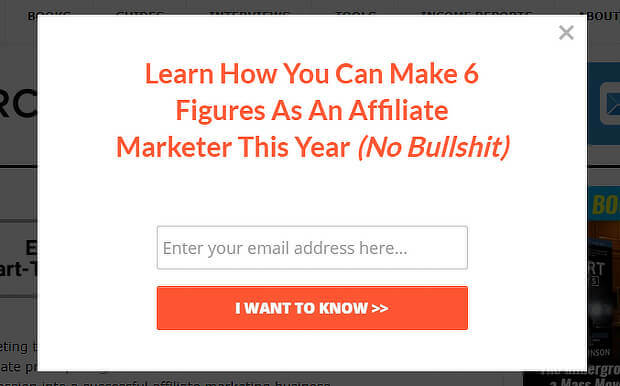 We’re going to tell you exactly why these popups work, so you can do it too. Just because a popup form design looks good, doesn’t mean it’ll work. And you certainly don’t want to waste your time perfecting a popup that won’t convert. If visitors don’t subscribe to your email marketing newsletter or grab your lead magnet, then it doesn’t matter how good your popup form design is. But with these optins, you don’t have to worry about that. 😎 Let’s get started. Think this example is too simple? You can’t argue with what works. Copy: The headline makes a bold statement about what’s on offer, using language that gets readers’ attention. The promise of something free is always an incentive to subscribe, and the message is repeated on the call to action (CTA) button. The subhead asks a question that identifies the core problem for her audience and ensures that she’s reaching the right people. Design: The design is pretty simple, but works because the green and purple mirror the site’s branding, creating recognition and a consistent experience for her visitors. Lilach Bullock keeps this consistent for all her campaigns. She does this by duplicating and changing the campaign as needed. Login to your OptinMonster dashboard, and select the three-dot menu to the right of the campaign. An exact copy of your campaign will appear at the end of the list of campaigns. You’ll be able to edit and publish it like any other campaign. Another factor in Lilach Bullock’s success was message repetition. She created an inline optin form and used it multiple times within the same piece of content. To do the same, follow our instructions to create an inline campaign. Make sure you have installed the WordPress connector plugin, then go to your WordPress dashboard. Click the OptinMonster icon to bring up your list of campaigns. Go to Edit Output Settings on your target campaign. Click the first button to enable the campaign to load on your site. Then, copy the Shortcode for this campaign. 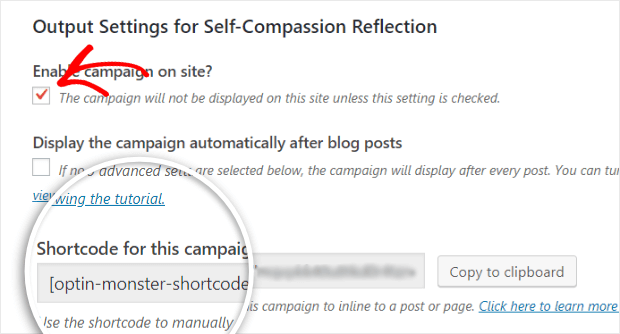 Now, you can put this anywhere in WordPress you want the campaign to appear! Looking for the best email popups to reach mobile visitors? Take a leaf out of the US Student Loan Center’s book. Copy: The copy uses the word “Forgiveness” in all caps to make sure it stands out and is immediately visible to the audience. It also establishes the USSLC’s authority with the phrase “everything you need to know”, which is mirrored on the image with the words “definitive guide”. The promise to make student loan forgiveness clear is also an attraction. The words “send me my guide” on the CTA button encourage readers to take ownership of the action. 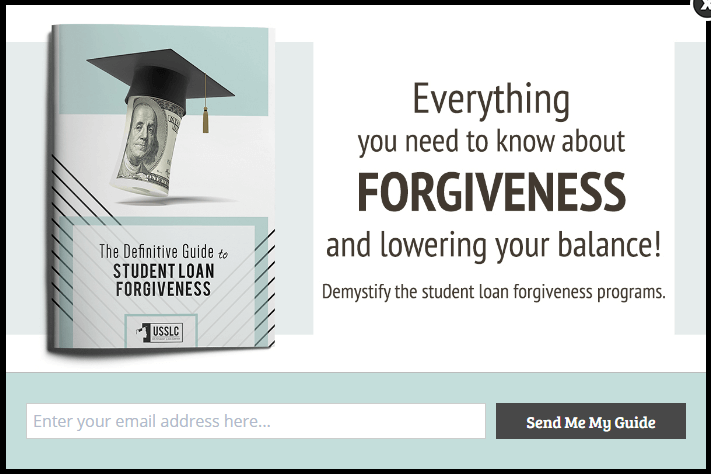 Design: Their popup design features an image of their free guide on student loan forgiveness. Since images get attention, this will catch the eye of their core audience. The colors on the image mirror the colors on the popup, which in turn match the branding of the site. This creates consistency for site visitors. Here’s how you can use their example to improve your own website marketing campaigns. One of their highest converting campaign types is mobile two-step optin with Yes / No Buttons which converts at 7.82%. This multi-step optin literally psychs your visitors into subscribing by using the Zeigarnik Effect. This psychology principle says when people start something, they’re more likely to finish it. To implement this on your own site, follow our instructions for creating a campaign. Then visit the Yes/No tab in the OptinMonster campaign builder, and click the Activate button to enable the view. Select the Yes Button, choose a Yes Action, and you’re good to go. USSLC also use MonsterLinks, which convert for them at 34%. These work well because they don’t interrupt visitors’ experience, plus you can easily adapt the link to any context. Creating MonsterLinks is easy. 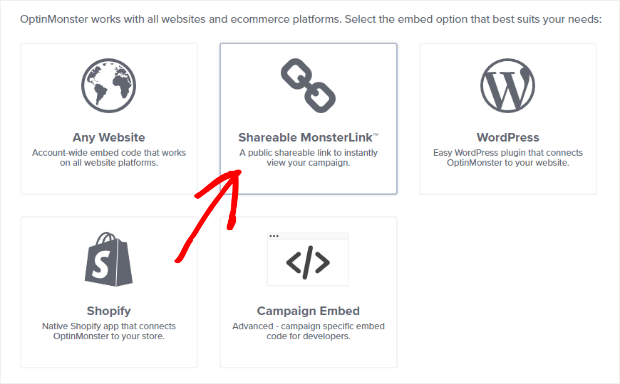 When you publish your campaign, you’ll see a Shareable MonsterLink as one of the available options. Click on the button to show the URL for the campaign. Then you can use that link anywhere. Copy: The offer of a free ebook offering a solution to visitors’ main problem is repeated three times on this popup, reinforcing the message. The copy on the bar across the main image highlights the core benefit for subscribers: reducing eczema flare-ups by eliminating diet-related causes. As above, the “Get my free ebook” CTA encourages readers to take ownership of the action. 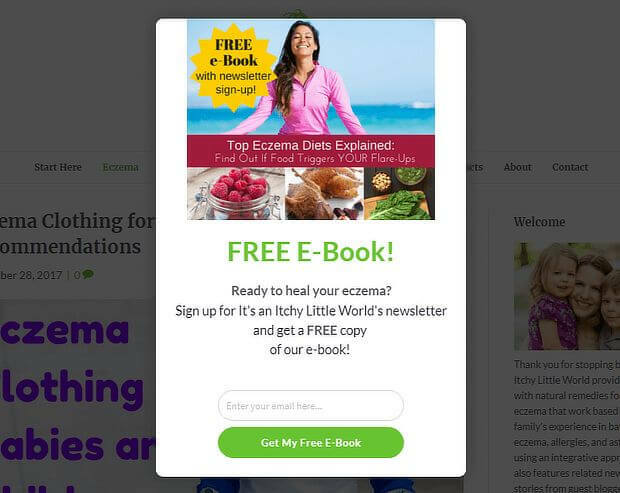 Design: This popup pairs an image of an attractive woman (who looks happy, and is therefore NOT itchy) with an image of food, reinforcing the message that the free ebook is about dietary causes of eczema. The green CTA button mirrors the green copy and is a color used for CTA buttons on their site, creating consistency for visitors. While split testing was one of the success factors for the company, we’re going to look at another: timed campaigns. Eczema Company found that adding a 2-step optin with Yes/No forms, that appeared after 30 seconds, resulted in a 20.37% conversion rate. To experiment with the timing for your own OptinMonster campaigns, go to Display Rules » If… Then choose the time on page condition, and in the second box pick between is at least or is no more than. You can change the timing from the default 5 seconds to longer so that you show your campaign only to engaged visitors. That increases your chances of getting them to subscribe. Copy: The copy is tied closely to the seasonal imagery. 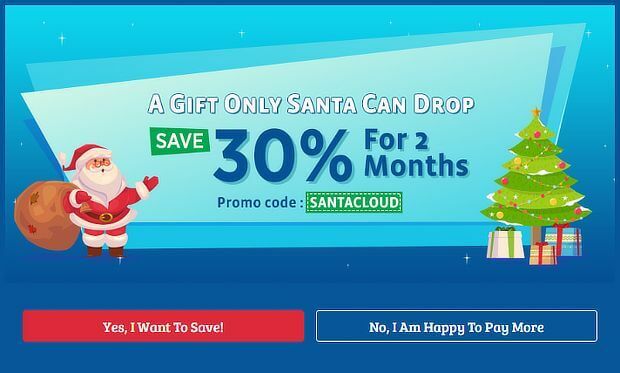 The word “gift” evokes seasonal good cheer, and even the word “drop” makes use of the dual meaning of dropping a gift under the tree and getting a price drop in the form of a 30% discount coupon. Even the copy on the promo code relates to the seasonal theme. Design: The design and copy are closely linked in this inspirational popup design. The blue background evokes the colder weather common at that time of year. Blue also evokes trust and is a subtle way of reinforcing the trustworthiness of the brand. The images of Santa, the Christmas tree, and gifts all underline the message. The use of a red button both relates to the seasonal theme and is designed to get attention. This popup also works because it uses Yes/No forms, and delivers a coupon. If you want to encourage visitors to sign up by offering coupons, you’ve got a lot of options with OptinMonster. While you should always send the coupon by email, you can also offer visitors instant gratification by adding the coupon code to your success message. To do this, visit the Success tab, and click on the text in the default message to edit it. When visitors subscribe or opt in, they’ll see the code right away. You can also use the Success Redirect URL field to add a link that applies a coupon when visitors click it. Just visit the Optin tab and click the Action button. Then, choose Editing Fields Element » Button » Action and set your Redirect URL. Here’s another simple but very effective design. It shows that when you get your copywriting down, you don’t even need flashy images. Copy: The copy reinforces the idea of education with the “Swim Up the Learning Curve” headline and the “Go Back to School” CTA. It makes it seem easy for readers to get the knowledge they need. Design: The red background matches the on-site branding for their resources, making it a seamless experience for visitors. 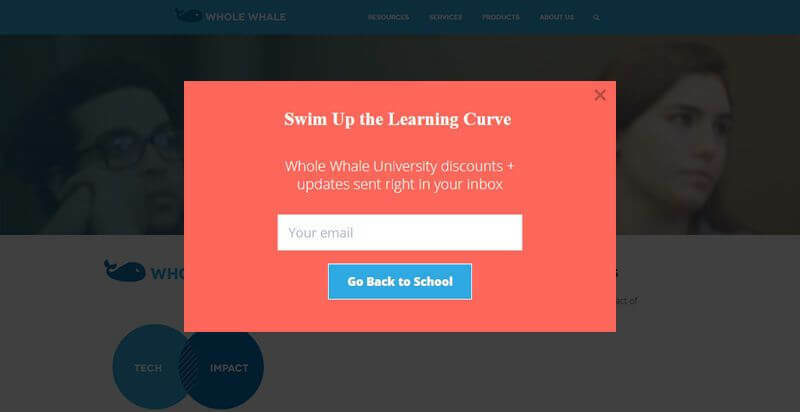 WholeWhale also matched their popup to user behavior. They did this by using OptinMonster’s page-level targeting to create a campaign specifically for one of their most popular pages. To apply this on your own site, create your campaign, then go to the Display Rules section of the OptinMonster campaign builder. On the If… menu, change the first box to current URL path and the second box to exactly matches. In the final box, add the URL of the page where you want the campaign to appear. Design: In this example, a simple arrow draws the visitor’s eye to the popup form design. The muted colors mirror some of the colors on the site, and the contrast in buttons makes the desired one stand out. Copy: The first person CTA makes the action personal for site visitors and answers the question asked in the headline copy. The copy also entices visitors by promising to change the way they view work. 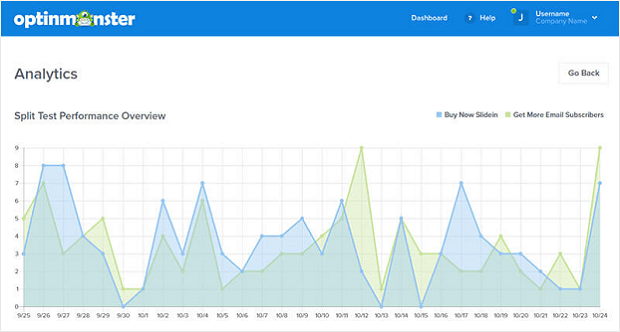 Logic Inbound got a 1500% increase in conversions by combining a number of OptinMonster features. They successfully increased free trial signups by varying the length of the free trial and using MonsterLinks™ as a campaign trigger. But what they also did was experiment with changing campaign layouts to see if different designs converted at different rates. To do this with your own campaigns, go into the OptinMonster campaign builder. 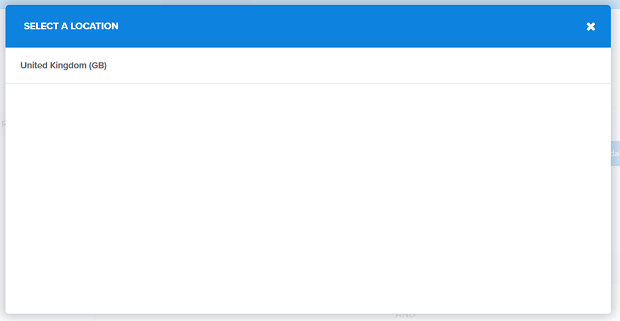 Click the Import Layout button at the top-right corner of the builder. This lets you play around with different layouts or build your own from scratch. With changing regulations, many businesses are concerned about using popups on mobile sites. With OptinMonster, there’s no need to worry, as this example from Salt Strong proves. OptinMonster is totally mobile-friendly and also complies with the latest guidelines for visitor-friendly ad campaigns. Salt Strong got a 185% increase in conversions by combining OptinMonster’s slide-in campaigns with Yes/No forms. To try this on your own site, follow our instructions for creating a slide-in campaign, then enable Yes/No as shown earlier. Here are some other reasons why this popup design works. Copy: Quizzes are one of the most effective ways to raise awareness of a brand, so including a quiz is a smart move to get visitors’ attention. 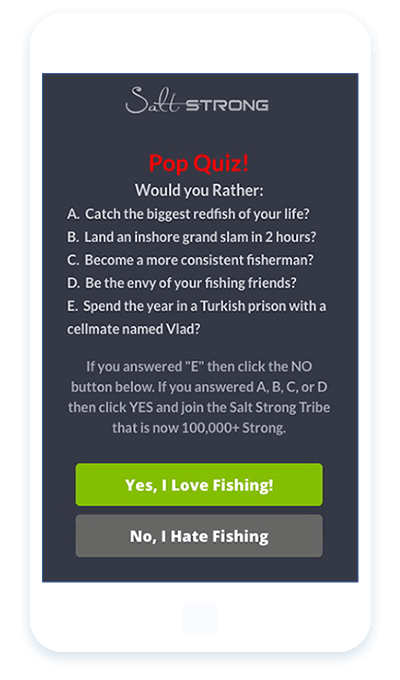 The button copy reinforces the quiz answers and also lets Salt Strong segment their visitors. Design: The grey background helps the copy stand out, especially the CTA button. This is a great way to make sure visitors see it. Copy: The copy is targeted to the core audience’s desire for high earnings from affiliate marketing, and the “no BS” promise seems to provide a guarantee that the method works. The “I want to learn” CTA encourages subscribers to take responsibility for pressing the button. Design: The design itself is simple, consisting of a plain white box with red letters so that visitors can’t miss the message. The company also wanted to make sure that their highest spending customers from particular geographical areas saw their best offers. So they used OptinMonster’s geo-location targeting feature to achieve this. The result? A 6500% increase in international conversions. To put this into action for your business, create your campaign as usual, then go to Display Rules » If… and choose the location you want to apply. If you want to add or exclude a specific country, type it in the box. If more than one location comes up in the validation box, click on the location you want. Then click the validate button to complete the validation process. Once you validate your location, you’ll be good to go. 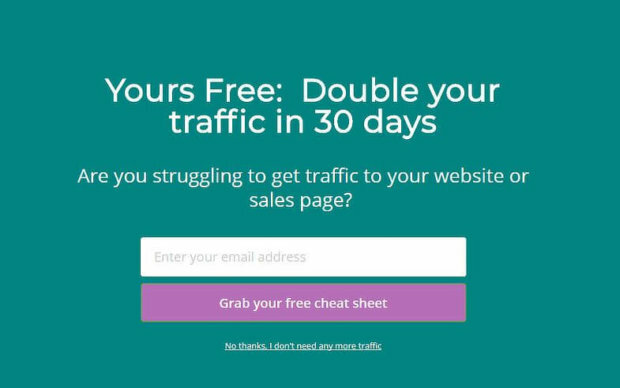 How do you know you’re targeting your website modal popups to visitors who really want to see them? One way to do that is with OptinMonster’s scroll trigger feature. Copy: The copy acknowledges that visitors are about to leave, and gives them a reason to stick around. Offers and coupons are powerful incentives for visitors. This is a low-cost tripwire offer designed to appeal to their core audience of people interested in digital marketing. Design: The colors and fonts on the optin form match the site’s branding. The green CTA button is highly visible, in contrast to the grey No button. You can enable Exit-Intent® by going to the Display Rules » If… section of the OptinMonster campaign builder. Change the first box to exit detected then choose the sensitivity. To target your campaigns by scroll percentage, go to Display Rules » If… and set the first box to distance scrolled and choose a scroll percentage. While the default is 15%, you can make it even higher if you want to be sure your visitors are truly engaged! Sometimes, the only way to figure out what’s going on with your campaigns is to test. That’s what Social Media Examiner did, trying out different templates, and experimenting with using or omitting images in their popup designs. The result: 250,000 new subscribers. Copy: There’s a lot of copy on this popup form, but it all has a purpose. The large headline promises a free report, which will appeal to the site’s core audience. The rest of the copy teases what’s inside to make the offer more attractive. 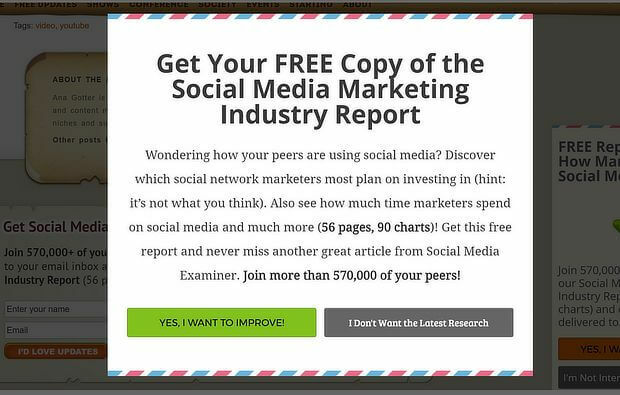 The inclusion of the size of the report, plus social proof about the site’s audience, makes it a no-brainer to sign up. Design: This example has no images, relying on the copy on a plain white background to sell the offer. The contrasting button colors highlight the desired option. Of course, as we said, this isn’t the only variation Social Media Examiner tried. Split testing is built into OptinMonster. Here’s how you can use it on your own site. Login to OptinMonster, then click the three-dot menu next to the campaign you want to test. Then choose A/B Split Test. You’ll be redirected to a page where you can give your test a name and description. Click Create Split Test. 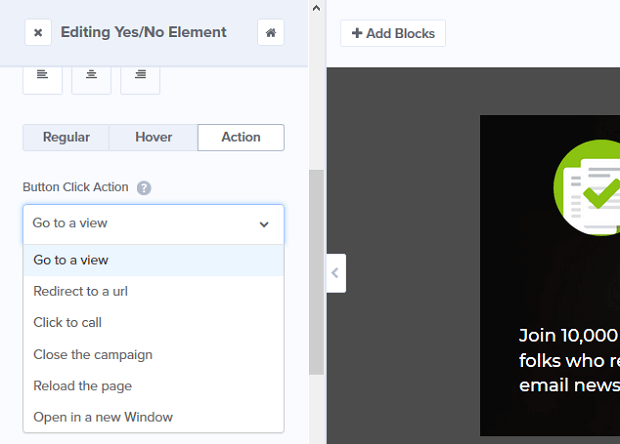 Change a single element on your campaign, then publish it. OptinMonster will automatically split your traffic evenly and collect conversion analytics data, so you can decide which is the winning variation. This popup from Padstows features the staff hard at work, ready to make your experience the best it can be—that definitely makes you want to sign up. Teslanomics invites people to get informed with an image targeted to their tech-savvy readers. Little Family Adventure combines a free ebook incentive with an iconic travel image (the VW camper van) designed to appeal to its core audience. 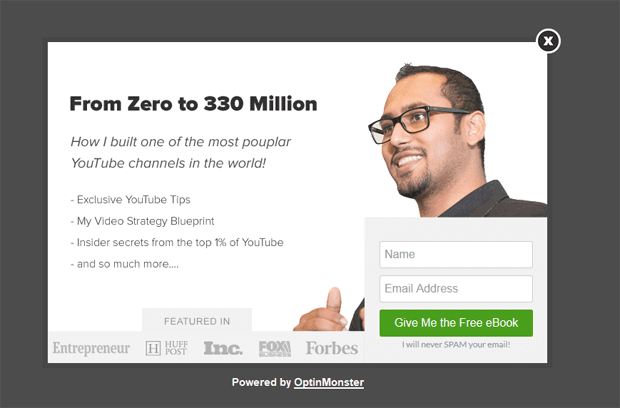 OptinMonster CEO and co-founder Syed Balkhi offers to share his secrets, including numbers and logos on the optin form as social proof. Clicteq subtly—or maybe not so subtly—underlines its message of building and growing with a city shot. That’s it! 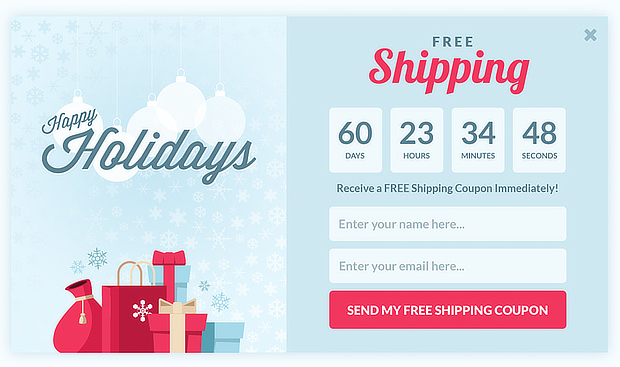 These are some of the best website popup designs we’ve seen from OptinMonster users. For more popup design inspiration, check out our gallery of popup examples and check out some more ways to boost engagement with OptinMonster. Follow us on YouTube, Facebook, and Twitter for more guides and tutorials.